Following months of extremely hard work by the mission control team at ESOC, the science team at ESAC, the ExoMars project team at ESTEC and industry, the Big Day has finally arrived! At 11:56 UTC (12:56 CET) yesterday, the ExoMars Trace Gas orbiter (TGO) executed the first of a series of seven thruster burns that will lower its orbit, step-wise, until it starts ‘feeling’ the wispy faint drag (see Notes below) due to the atmosphere of Mars. The burns are taking place between 15 March and 6 April. Yesterday’s was the biggest, delivering a planned ‘delta-v’ (change in velocity) of about 3 m/sec. The effect of the first manoeuvre will be to take the periapsis – the point of closet approach above the surface – altitude down to about 150 km above the surface; the rest of the burns will be smaller. “The first manoeuvre can be likened to ‘testing the water’,” says Michael Khan from the Mission Analysis team at ESOC. If the first three days go as expected, there will be another manoeuvre to lower the periapsis altitude to 140 km, on 18 March. That will significantly up the ante, exposing the spacecraft to notably higher aerodynamic loads. If that, too, goes well, three days later the periapsis will be again lowered by 10 km. After that, the lowering will happen in smaller increments. 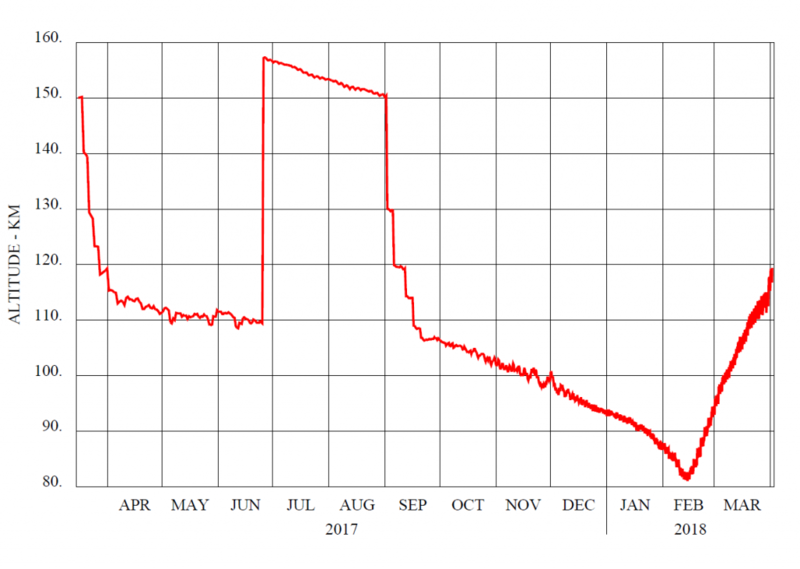 The currently foreseen periapsis altitude at the end of the walk-in phase on 6 April, i.e., when aerobraking will be in full swing, is 113 km, but this may well change subject to what TGO experiences during the walk-in. So, as of 6 April, the craft will begin the critical, year-long ‘aerobraking’ phase proper, using the faint drag of the very upper reaches of the Martian atmosphere to slow the craft, lowering its orbit. In the aerobraking technique, the ever-so-faint drag the craft experiences at periapsis slows it such that the height of its apoapsis – the point one-half orbit later when it makes its highest passage over the surface – is steadily reduced. If all goes well, by early 2018, the orbit will have been transformed from its current highly elliptical shape, at 33 000 km x 200 km with one revolution per 24 hours, to a circular orbit at about 400 km x 400 km with one revolution in about two hours. This will be the routine orbit for the main science phase, and is optimised both for science data-gathering and to enable TGO to serve as a radio relay platform, transmitting signals from surface assets like rovers to Earth. “It’s a great technique for saving fuel, which means our spacecraft could be designed, built and launched without needing to lug along hundreds of kilogrammes of extra fuel [we saved about 600 kg – Ed.] to conduct the long engine burns that would otherwise be necessary,” says Spacecraft Operations Manager Peter Schmitz. But aerobraking means that, for most of a year, the mission control teams at ESOC in Darmstadt, Germany, will have to work very intensively, monitoring and assessing the spacecraft’s progress very closely and making tiny adjustments to the orbit by firing the thrusters if needed. Spacecraft Operations Manager Peter Schmitz seen sitting in the Main Control Room at ESOC, at left, in discussion with ESA’s Head of Mission Operations, Paolo Ferri, just after ExoMars/TGO launch in March 2016. Deputy Operations Manager Silvia Sangiorgi sits on console at right. Credit: ESA/P. Shlyaev. “If the drag is too gentle, we need to get lower; if the drag is too high, we need to get higher,” says Peter. And there won’t be much time available to react in case anything unexpected happens. “Aerobraking will be especially demanding for our flight dynamics experts, who must conduct regular and frequent orbit determinations so that we know exactly where the spacecraft is, which is necessary for things like planning ground station communication passes,” says Peter. The unpredictability of the aerobraking effect during each orbit – and the resulting uncertainty in attitude and orientation – will also affect the star trackers, which might be temporarily be blinded if they are pointed at any part of the Mars limb during or after an aerobraking pass. “It’s hard to overstate the demanding amount of planning, careful assessment and regular, time-limited command cycles that will be required during aerobraking,” says Peter. One of the big factors the team will have to accommodate is the unpredictability of the Martian atmosphere. The Mars atmosphere, comprising mainly carbon dioxide, is very thin in comparison to Earth, and its density is highly changeable. Close to the surface, its temperature and density are affected by variables such as the weather, dust storms, sunlight and hard-to-predict (in real-time) effects such as solar heating of the surface (causing convection currents). At the very upper altitudes, around 113 km where TGO will begin aerobraking orbits, it is extremely thin, with a density on the order of just 10^-7 Kg/m3, and solar activity and dust storms can have a big effect on density. The net result is that the amount of slowing due to atmospheric drag during each aerobraking passage (the segment of the orbit around periapsis) can vary unpredictably, and teams will have to watch carefully to asses actual braking results. Further, the spacecraft is designed to handle certain maximum levels of heat and dynamic pressure, and teams will have to watch carefully to see that these are not exceeded. For example, the temperature due to frictional drag on the specially designed solar arrays should not exceed 145 C.
“With current plans, we only expect to see around 70 C on the arrays, and a few degrees more would be no problem,” says Spacecraft Operations Engineer Chris White. This is also why the spacecraft is being lowered step-wise through the seven thruster burns during the ‘walk-in’ phase taking place now, so that aerobraking only begins when the craft starts to experience a certain target atmospheric density, and not more or less. “The atmospheric models aren’t perfect, so we have to ‘feel’ our way down to the start of aerobraking proper,” says Chris. Note that when going through each aerobraking pass at periapsis, TGO will be out of contact with ground stations due to the spacecraft’s special attitude (pointing engine-first in the direction of flight, tilted slightly ‘up’ – see diagram at right), which means the high-gain antenna will be off-pointed away from Earth. Engineers have spent months planning for aerobraking, which will use atmospheric drag to lower the spacecraft into its final ca. 400 x 400 km routine science orbit. When it comes to the heat and pressure of aerobraking, here are some of the physical limitations of the spacecraft – which are being applied with a 150% safety margin! The aerobraking phase will have to be interrupted for about two months due to the solar conjunction when Mars is behind the Sun as seen from Earth – radio ‘noise’ from the Sun will interfere with the radio-frequency signal between TGO and Earth [conjunction season is also known as ‘low-bit-rate season‘ – Ed.]. A key element in this pause is that the TGO periapsis will be deliberately raised (by a manoeuvre) so that it stays above the atmosphere for these two months – so the spacecraft is safe even if not controlled as tightly as atmospheric passes require. “From the end of August, aerobraking will be started again by repeating the step-wise descent into the atmosphere that we are just doing now,” says Flight Director Michel Denis. During these weeks, even with not too much happening with the spacecraft itself, the mission control team will be extremely busy with reviews, assessing results, bench testing, software validation and preparation for the next, final phase of aerobraking and much else. “During this intense activity, the team will also take advantage of conjunction period to book some leave,” says Peter Schmitz. 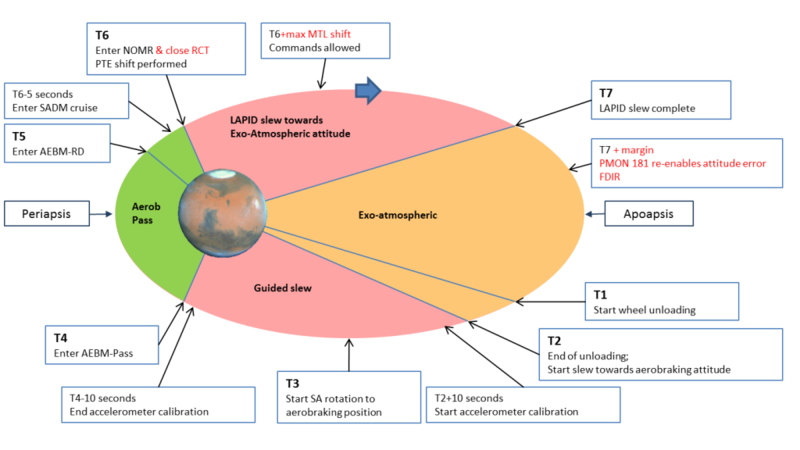 Once Earth and Mars continue in their orbits so that Mars has moved more than ~10° away from the Sun as seen from the ground, normal communication passes can restart and aerobraking can recommence. If all goes well, by early 2018, TGO will be pretty close to a ca. 120 x 400 km orbit, and, in principle, will need only a short boost or two to circularise the orbit to 400 x 400 km. But ending aerobraking won’t be quite that simple for the operations team. One big factor will be that, by this time, the orbital period will be down to just two or so hours. This is a factor because the craft has to slew using its reaction wheels into a specific attitude for each aerobraking passage, then slew back into an Earth-pointing attitude to conduct the subsequent communication pass. “Our reaction wheels, while reliable, are somewhat small, and TGO is somewhat massive, so slewing is slow, and we may find that there is insufficient time margin to conduct the required slews during each orbit when each orbit only lasts two hours,” says Peter. While this is the first time we’ve used aerobraking to achieve an operational orbit around another planet, this is not the first experience with the technique for teams at ESA. A few years back, in 2014, Venus Express conducted a lengthy aerobraking campaign at the end of its mission, using the technique to lower itself steadily into the Venusian atmosphere to gather valuable science data from previously unexplored altitudes. NASA have also used aerobraking at Mars – to bring the Mars Reconnaissance Orbiter and other spacecraft into low orbit at Mars. In fact, the spacecraft is already feeling the ‘wispy fainties’ now, with its periapsis still firmly outside the real atmosphere at 200 km. ESA teams ‘see’ the drag effects in spacecraft Doppler data – detected by analysing the communication signals transmitted by TGO – and they see it in unplanned attitude changes. Many thanks to Peter Schmitz, Michael Khan and Chris White for their inputs and review of this post. Please, could you explain the acronyms in the “TGO – typical aerobraking orbit. …”-illustration? LAPID: Large Angle Proportional Integral Derivative. Type of attitude control used when we’re slewing automatically towards a fixed target attitude, as distinct to the usual way, way is to follow a guidance profile. Used here because the atmo pass induces unpredictable errors on the attitude, so we don’t know where we’re starting from. PMON: Parameter MONitoring. Part of the onboard FDIR (you know that one! ); a PMON triggers an FMON, and the FMON executes a command in response. How do you know its altitude and its orbital parameters? Are they calculated on the ground or does TGO has a way to measure them? 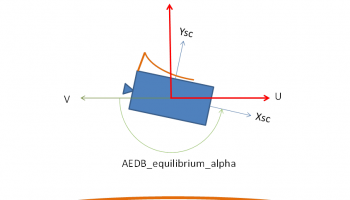 The spacecraft’s orbit and its attitude (pointing) are determined on ground, by a team of super-talented experts in the Flight Dynamics division at ESOC. They use a number of data inputs to make their assessments including images from the star trackers and radiometric data (ranging based on the one-way signal time & Doppler shift) from the ground stations that communicate with TGO , in addition to highly sophisticated data analytical techniques such as Delta-DOR.